Sticky Notes is a very well known feature of Windows and it comes in handy to jot down a lot of important and less important things. If you are Outlook user, then you’ll be surprised to know that Microsoft Outlook also offers you built in Sticky notes that you can access via keyboard shortcut. It saves all your notes in Outlook itself and you can access them whenever you want. Sticky notes can be useful to add some note related to an email, meeting, etc. Moreover, it can also be used when you don’t want to add some less important event in the Outlook calendar. The notes in Outlook work in the same as Windows’ Sticky notes. You can create different notes and assign different colors to them. All the notes that you create can also be saved to PC as MSG files and later you can send them as email attachments. 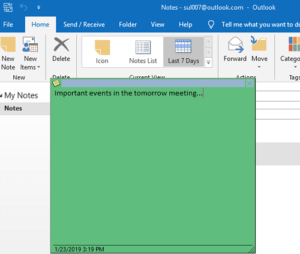 The Sticky Notes is really a remarkable feature of Outlook and you may use it for writing down some things that you want to remember while composing emails. 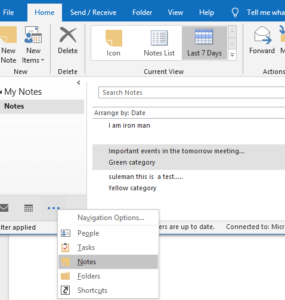 There is a separate Notes section in Outlook that also helps you search the notes. Not only this, but you can also change the view mode of all the notes to list or icon view. Filters feature is also there to list notes according to dates. Creating notes in Outlook is not a big deal. The best part is you can call notes via simple keyboard shortcut. You can keep notes anywhere on your screen as they are resizable and movable. However, the feature to pin notes on top is not supported. Use the Ctrl + Shift + N to invoke notes and write anything that you want and save it. Apart from just creating and saving notes, you are allowed to categorize them as well. Create different categories for notes and assign different colors to them. All the notes you create in Outlook are saved in the dedicated Notes section. You can see all the notes you have created so far and do whatever you like. It saves notes in the same way as you save them in different categories. 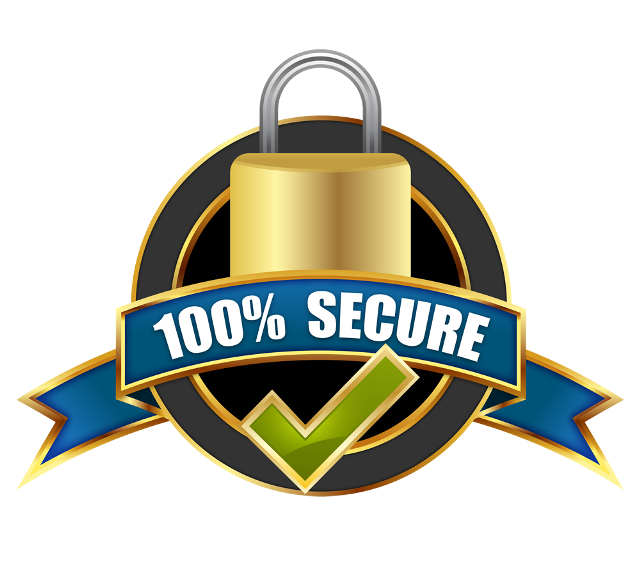 The notes can directly be forwarded to emails and you can print them as well. To see all the notes you have saved in Outlook, click on the 3 dots icon from the bottom and then select Notes option. It will show all the notes. That’s all about the Sticky Notes feature in Microsoft Outlook. If you didn’t know about this feature, then you will find this post very useful. Not sure about older versions of Outlook but on Windows 10, you will definitely get this feature in Outlook. So, just create notes right in Outlook and then keep them with you forever. If you use multiple PCs with the same account, then Notes will be synced automatically. However, it will not happen in the mobile application of Outlook. If you want Outlook notes with you on all platforms, then you can save them in OneNote.